A general view shows the mountain resort of Davos, Switzerland Jan. 15, 2019. 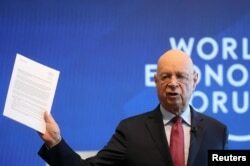 Klaus Schwab, Founder and Executive Chairman of the World Economic Forum holds the meeting's manifesto as he addresses a news conference ahead of the Davos annual meeting in Cologny near Geneva, Jan. 15, 2019. “Globalization produced winners and losers, and so there were many more winners in the last 24, 25, 30 years. But now we have to look after the losers — after those who have been left behind...what we need is a moralization, or re-moralization, of globalization,” he said.